Mr Humprey Kisioh is a Kanyan by nationality. He holds a MSc in Wood Science and Technology from University of London, Diploma of Imperial College, London and a BSc in Forestry from Makerere University, Kampala, UGANDA and achieved. 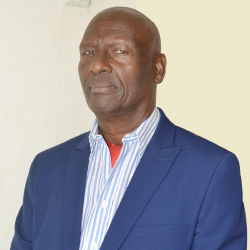 Mr Kisioh has many years’ experience in services related to International, Regional and National Policy and institutional development, as well as review, analysis and harmonization of environmental policies and institutions. He provides expertise and advisory services in the formulation of relevant policies, institutional processes, strategies and plans. He has been providing consultancy services in large-scale conservation planning and integrated management of landscapes and ecological networks, ecosystems and renewable resources involving clear perspectives and understanding of the linkages between science, policy and the desired developmental outcomes. Mr Kisioh has a strong passion for nature and compassion for People. He was involved in the conservation of many vital ecosystems in Eastern Africa including among others Mt Kenya, Mt Kilimanjaro. Mt Elgon, Serengeti / Mara, Eastern Arc and Coastal Forests, The Albertine Rift Valley and the Greater Virunga Landscape, Forests and Protected Areas.